When it comes to cabinet care, humidity and temperature control are just as important as proper cleaning and maintenance. Interior climate fluctuations can create multiple symptoms, including issues with wood. To keep your cabinets and wood components at their best, maintain a consistent range of temperature and humidity within your home. 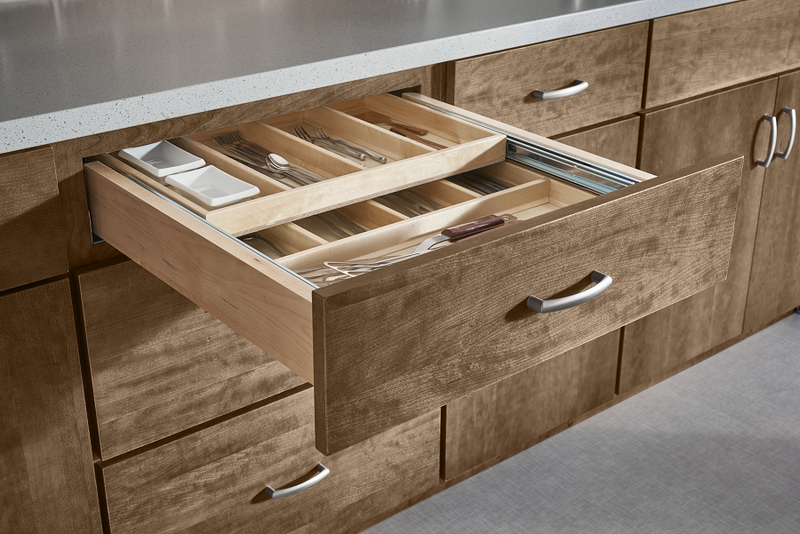 Try to avoid sudden changes that may cause material swelling or shrinking and result in finish damage to your cabinetry. Wood cabinets expand as humidity increases and shrink as humidity decreases. To achieve the best moisture conditions for your cabinets, maintain an indoor relative humidity level of 35-50 percent. Often, cabinet doors and/or drawer fronts are constructed of multiple wood pieces. Whether raw or finished, expansion and contraction can cause slight separations of individual pieces at joints. These separations may become visible as small cracks. This can occur with all finishes but is much more evident on painted wood than it is on stained wood. Under dry conditions, cabinet door center panels may shrink and the unfinished panel edges may become visible. Exposed, unfinished panel edges will not match the finished surfaces of the rest of the panel and door. This panel shrinkage is not a reason for replacement but is instead an indication that humidity levels are too low. Increasing the humidity level above 35% will expand the panel back to its original state. In certain dry climates, low indoor humidity levels often must be addressed with a whole-house humidifier. For new cabinetry, it’s a good idea to allow them to stand in the room (or an adjacent room) where they will be installed for a period of time to acclimate to the environment prior to installation. Do not store them in a garage, basement or other unheated or unconditioned space. Interrelated with humidity levels, temperature fluctuation in the home can produce similar problems. Increased temperature causes materials to expand, while decreased temperature causes materials to contract or shrink. Sudden climate changes may cause more dramatic material changes such as shrinkage, expansion, cracking and splitting in solid wood, and warping, cupping and bowing in wood components. The recommended temperature range for the interior of the home is between 60º-80º F.
Repeated exposure to moisture, such as splashing of cabinet surfaces from a kitchen or bathroom sink or food prep area, can result in damage to wood cabinetry finishes and substrates. Repeated exposure to steam from cook tops, crock pots, improperly sealed dishwasher doors and other appliances can also damage cabinetry finishes. Dry off any areas immediately where water has spilled, and avoid draping dish towels or other wet items over cabinet doors. Many interior environmental factors that affect human comfort also contribute to cabinet conditions. Properly controlling temperature and humidity inside your home will be healthier both for your family and for the cabinetry and furniture within.